An estimated 31 million Indians are still unemployed as of March 2018. With a lower increase in the GDP as compared to the rise in population, finding a job has become a competitive issue in India today. Though the rampant use of technology has given rise to many startups such as Ola, Facebook or Paytm solving major consumer issues; Unemployment is one of the biggest global issues currently right after the safety of the environment and world peace. But how can the direct inclusion of technology in the daily lives of individuals help to reduce if not bring down the rate of unemployment in the country? This is possible by combining technology with education. The concept of digital education has revolutionised the world of education in the past decade by being affordable, accessible and progressive. It has helped many governments around the world educate their citizens in different aspects of civil rights and thus is helping improve communities. Private edutech companies revamped the way of schooling as we know it. But how does all of this have an impact on the unemployed? Let us explore this in detail. Did you know that the average fee for an MBA from any IIM is about 15 Lakh Rupees? Not every talented MBA aspirant might be able to afford this fee. An MBA degree with a relevant certification is available for a lesser cost and easier accessibility online. Online courses have made it easy not just for postgraduate or graduate level students but also for primary, secondary and higher education in equal proportions. An estimated 35 Million children between the age of 6 and 14 do not attend school in India. While there are many reasons for the number of children being out of school, not being able to afford further education after the basic education is one of the main reasons. When students of backward economic categories realise that there are more substantial opportunities available for them at affordable costs, it encourages them to pursue a stable education. Many of the major educational institutions are based in the cities. This proves to be challenging for many students who wish to pursue courses at particular universities. Online learning portals of such universities help bridge these gaps by enabling remote learning for these students. Many universities have increased and extended their online degree programmes for the very same reasons. The Government of India has taken many measures to help promote online education and skill development aimed to increase the employability of the citizens. The Human Resources and Development Ministry has launched Swayam, an online portal designed to provide quality education to underprivileged students. Anyone can access any course from anywhere at any time. This content repository can help students to leverage the free training and certifications to update their current skill set and avail better employment opportunities. For developing countries such as India, meaningful employment is when the workforce is making an impact towards the development of the country. So technically, a daily wage labourer is still unemployed if he has the potential and capability of clearing UPSC. One of the major perks of online education is its accessibility. Course content can be accessed from anywhere and at any time. This helps students from poor economic backgrounds to work odd jobs and still study to gain a degree to obtain better employment opportunities. Apart from students, digital education can help homemakers as well. Uneducated homemakers who wish to start a career can leverage online learning. They can take up online courses and resume/kick start their training, be self-employed and thus be empowered. A working professional is still prone to unemployment if he/she is not up to date in their professional skill set. Online courses are refreshed continuously, and the course content is updated from time to time. This helps working professionals to keep learning and stay updated. It is not only working professionals who benefit from the up to date content. It has been estimated that a staggering 80% of Indian graduates are not employable. Students preparing for competitive exams like the UPSC or CAT also tend to use such content repositories instead of overpriced textbooks to stay relevant. In addition to helping working professionals stay up to date, digital education also helps them to step up in their career. With more and more jobs becoming obsolete, new and better opportunities arise. 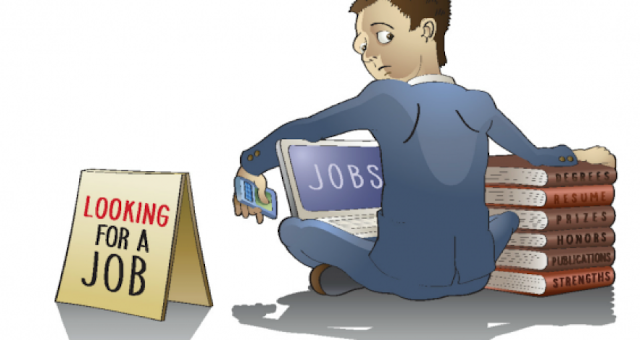 When a domain becomes outdated, the workforce in that particular industry become jobless. Digital learning is a quick way for these professionals to look at alternative forms of employment, train themselves into the ways of that work and thus climb up the career ladder. For any vertical of digital learning to work effectively and impact the unemployment numbers of the country, better internet connectivity and higher internet penetration (particularly in the rural areas) has to occur. If such expansion is a reality, then India’s unemployment will reduce faster than ever.